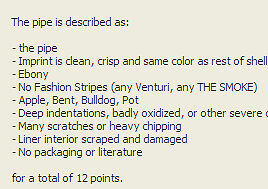 The value of pipe #474 is 12 points. Dave Nickles offered this pipe in a lot on eBay. I wrote him and asked if the stummel was over 3" (trying to find the elusive Giant Pot) and was very excited by his reply. I won the bidding, but was very disappointed to find that he had mis-measured and this was a Pot. The pipe has been smoked a lot and abused more than a little. The mouthpiece has some toothmarks but no dents or holes. The bowl liner has been improperly cleaned and is damaged. It will do for a starter pipe or fishing or gardening knock-about. A very nice young lady found this site and decided to give the pipe a try, selecting this one for her first. I hope she likes it!